Former New York City Mayor Michael Bloomberg believes taxing the poor is the best way to change undesirable behavior. 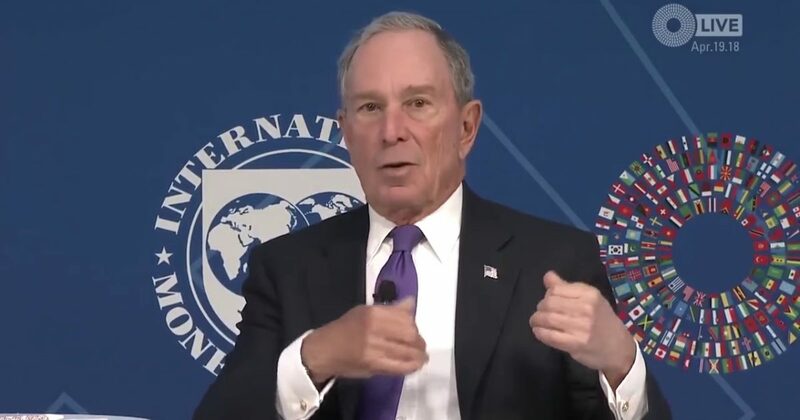 Bloomberg made his comments at the Spring Meetings of the International Monetary Fund (IMF) and the World Bank Group in Washington, D.C.
Michael Bloomberg: “Some people say, well, taxes are regressive. But in this case, yes they are. That’s the good thing about them because the problem is in people that don’t have a lot of money. And so, higher taxes should have a bigger impact on their behavior and how they deal with themselves. So, I listen to people saying ‘oh we don’t want to tax the poor.’ Well, we want the poor to live longer so that they can get an education and enjoy life. And that’s why you do want to do exactly what a lot of people say you don’t want to do. Bloomberg is a classic progressive who believes in using government action to change the behavior of people because they are too stupid to make good decisions. The former New York City mayor used the strategy of using regressive taxes when he ran the Big Apple. Under Bloomberg, New York City significantly raised taxes on cigarettes and also taxed sugary drinks. Bloomberg is also a big believer in climate change regulations and advocates for gun control. Bloomberg is a progressive elite and even though he is not in the political office he uses his immense wealth to push his left-wing agenda.